Before I begin this entry I just want to say again (at least, I think I’m saying this again?) that I’m really glad I discovered the entry scheduling feature on WordPress. So now on days where I get in the mood to write 5 entries, I can now spread them out across several days instead of posting them all at once and then having a huge gap of silence on my blog until the next entry. This means I probably have a good chance of knocking out that one blog New Years resolution after all. Never would have thought it possible before now. Anyway, onto the entry. I actually reviewed this film for Tysoncarter some time ago for an IMDB film reviews challenge he sent out sometime last year. I meant to copy those reviews to this blog mostly for archival purposes at some point, but I just never got around to it until now. I was planning on changing the wording for the review, but I liked how I worded this particular one, so I decided to keep this one the same. I haven’t decided for the others, but it’s more likely those will be changing some since I don’t really want to be redundant. This and one other entry I wrote for him will probably be the same; the other three I wrote for him will likely be altered, however, since I think those can be expanded upon. 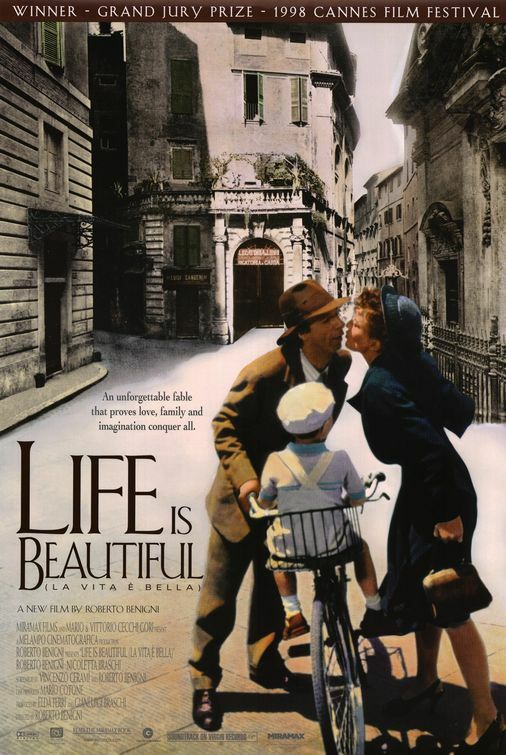 Life is Beautiful might not be as graphic as say Schindler’s List (1993) or The Pianist (2002), but I think it is equally as intense. Given the subject matter, that shouldn’t come as a surprise. This story is about a Jewish man, his family, and their experiences before and after being imprisoned in a concentration camp. I actually stumbled on this movie by accident, when I was about ten or eleven years old. I remember this being one of those movies on my mom’s separate “grown ups only” shelf, all of which I had been told numerous times not to even think about watching until I got older. The selection included Patrick Swayze and Demi Moore’s Ghost (1990), Stepmom (1998), and The First Wives Club (1996), to name a few, and all of which I plan to eventually review on this blog—no promises as to when though. Based on my personal experience, I’ve decided that the best thing to do to prevent a curious kid from watching things they shouldn’t, is to put it all under lock and key someplace and to just not draw attention to it, not even a warning. After all, warnings actually make things all the more enticing to children…but I digress. Unless you’re very much not the sensitive type, I’m pretty sure this movie will have you bawling like a baby by the end of it. From the fairytale-like romance between the parents to seeing how much love this father has for his son, you will likely have emotions ranging from warm and fuzzy to absolute heartbreak. I would also say that the cast was tremendously talented—Giorgio Cantarini was adorable in his role as the son and I thought Roberto Benigni was downright phenomenal. Quite honestly I don’t think I can do the film enough justice in a review without spoiling the story entirely, and even then, I think it’s worth watching at least once. Personally, I could only really handle watching this once, and I was definitely traumatized by it, though I think it was mostly because of how old I was when I watched it. I think this is one of those rare films where almost every haunting detail of it is forever impressed in my memory. If WWII-themed movies are your thing, or if you just like war movies in general, then you may want to check this movie out. I’m sure you won’t be disappointed. You’ll laugh, cry, and it’s quite possible by the end of it you may want to reach for your remote and flip to Comedy Central. Admittedly, what kind of ruined this movie for me was seeing it dubbed in English instead of in its original Italian language. Still, it’s a great movie. Oh, I never watched it in English. I don’t doubt that it’s far better in Italian. The scene that comes to mind is when Guido was serving his son along with several German children who were visiting the concentration camp. The son let slip a “Grazie” in Italian, which almost blew his cover as a non-German. In the dub, he said, “Thank you”. The scene didn’t make sense because everyone in the dub spoke English anyway. Ah yeah. Not to mention I imagine the English dub sounds really………fake? Is that the right word? Mechanical? Overly exaggerated? All of the above? I’m sure you know what I mean. The bigger issue was the distracting mismatch between lip movements and the spoken dialogue. Oh yeah. There’s ALWAYS that, for sure.